Yesterday’s 13th meeting of the season was made up of nine races, all for trotters. The most important on the card was the Premier Class race which was held over a short distance of 1,640m. This race was won by Danish horse Nico Oland, driven by Julian Farrugia. Fifteen started the Premier race and Brigadoon (Rodney Gatt) was the fastest at first with Quesito d’Or (Anton Cassar) and Nico Oland close behind. Brigadoon was unable to keep the same scorching pace for long and midway through the straight for home it was reeled in by Nico Oland which went on to register its first win of the season. Vejby Boom (Carl Caruana) was the runner-up ahead of Brigadoon as French debutante Ramses De Vaudon (Emmanuel Fenech) came it at fourth. Nico Orland clocked 1.13.1” per kilometre. The card yesterday also included championship heats for Silver Class trotters. As expected, favourite Ollico Pellois, under the guidance of Noel Baldacchino, dashed strongly from the outside to win the opening heat and gain its second consecutive win of the year. Royal Apanage (Redent Magro), Tomorrow Cut (Dolan Casha) and Alfa Dream (Rodney Gatt) followed home in that order. A keen duel between two Swedish trotters, Sitka Rod (Tony Demanuele) and Lajos Bellan (Noel Baldacchino), developed in the final metres of the next heat. At the post it was Sitka Rod first ahead of Lajos Bellan. Memory Chip (Julian Farrugia) and Paolin De Bannes (Rodney Gatt) also qualified for the semi-finals. In the third heat, German gelding Herzbrecher (Rodney Gatt) went unchallenged for most of the 2,140m distance, finishing first by more than a length from French newcomer Touareg Du Boscail (Noel Baldacchino). Lazer Crown (Matthew Farrugia) and Rio Du Gers (Clint Vassallo) completed the top-four order. Orage Du Pont (Julian Farrugia) slowed down around 200m from the post in fourth heat action. The early leader was overtaken by Razor Shadow which, under the guidance of Nathaniel Barbara, sealed its second win in a row. In the remaining heat, Rapide Du Matin (Emmanuel Spiteri) dashed strongly with 500m to go for its third win this year. 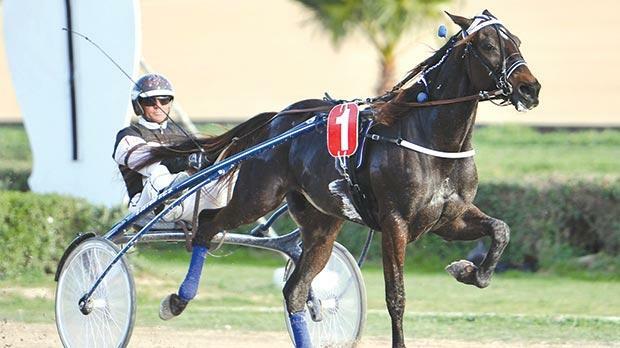 Sirocco Kadesh (Noel Baldacchino) was second ahead of Beckham Bob (Charles Camilleri) and Regent De Tillard (Ramon Caruana), the last trotter to make it to the next stage of the Silver Class championship semi-finals. Meanwhile, the Assikura Championship final for Bronze Class trotters on 2,140m was held on Saturday afternoon. This race was won by Quipson (Rodney Gatt) which took the lead midway through the final straight as it swept aside the challenges of Uranium Des Arkads (Kurt Saliba), Quersis (Noel Baldacchino) and Voila Dry (Ivan Bilocca). Another meeting at the racetrack will be held on Sunday.